The Ball is a geodesic sphere, 12 feet in diameter and weighing 11, 875 pounds, built to withstand the stresses of high winds, precipitation and temperature fluctuation to brightly shine over 400 feet above Times Square throughout the year. For 2011, Waterford Crystal has designed 288 new "Let There Be Love” crystal triangles featuring a romantic pattern that blends a modern cascade of hearts with diamond cutting. 288 triangles are emblazoned with last year's "Let There Be Courage" design of a ribbon medal defining the triumph of courage over adversity; and 1,152 triangles sparkle with the "Let There Be Joy" design of an angel with arms uplifted welcoming the New Year. The remaining 960 triangles are the original "Let There Be Light" design of a stylized radiating sunburst. The 2,688 crystal triangles are bolted to 672 LED modules which are attached to the aluminum frame of the Ball. The Ball is illuminated by 32,256 Philips Luxeon Rebel LEDs (light emitting diodes). Each LED module contains 48 Philips LEDs - 12 red, 12 blue, 12 green, and 12 white for a total of 8,064 of each color. By mixing these four colors, the Ball is capable of creating a palette of more than 16 million vibrant colors and billions of patterns producing a spectacular kaleidoscope effect atop One Times Square. WATERFORD CRYSTAL created an exclusive "Let There Be Joy” design for the crystal triangles on the new Ball. Designed and crafted by Waterford artisans in Ireland, "Let There Be Joy” features the design of an angel with arms uplifted welcoming the New Year on each of the 1,728 new crystals. The remaining 960 triangles are last year’s "Let There Be Light” design of a stylized radiating starburst. "We tried to create a beacon of light in the sky over Times Square,” says Paul Gregory, Principal Lighting Designer for Focus Lighting. For Times Square 2000, the millennium celebration at the Crossroads of the World, the New Year's Eve Ball was completely redesigned by Waterford Crystal. The new crystal Ball combined the latest in technology with the most traditional of materials, reminding us of our past as we gazed into the future and the beginning of a new millennium. The 2000-2007 version of the Times Square New Year's Eve Ball (.pdf), designed by Waterford Crystal, made its first descent during the last minute of the 20th century, at the Times Square 2000 Celebration. The Ball was a geodesic sphere, six feet in diameter, and weighed approximately 1,070 pounds. It was covered with a total of 504 Waterford crystal triangles that varied in size and ranged in length from 4.75 inches to 5.75 inches per side. For the 2007 New Year's Eve celebration, 72 of the crystal triangles featured the new "Hope for Peace" design, consisting of three dove-like patterns symbolizing messengers of peace. The remaining 432 triangles featured Waterford designs from previous years, including the Hope for Fellowship, Hope for Wisdom, Hope for Unity, Hope for Courage, Hope for Healing, Hope for Abundance, and Star of Hope triangles. These crystal triangles were bolted to 168 translucent triangular lexan panels which were attached to the aluminum frame of the Ball. The exterior of the Ball was illuminated by 168 Philips Halogena Brilliant Crystal light bulbs, exclusively engineered for the New Year's Eve Ball to enhance the Waterford crystal. The interior of the Ball was illuminated by 432 Philips Light Bulbs (208 clear, 56 red, 56 blue, 56 green, and 56 yellow), and 96 high-intensity strobe lights, which together create bright bubbling bursts of color. The exterior of the Ball featured 90 rotating pyramid mirrors that reflect light back into the audience at Times Square. All 696 lights and 90 rotating pyramid mirrors were computer controlled, enabling the Ball to produce a state-of-the-art light show of eye-dazzling color patterns and a spectacular kaleidoscope effect atop One Times Square. 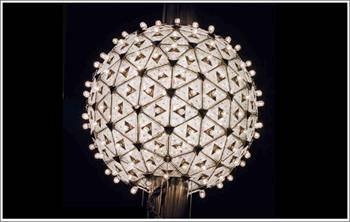 The now-retired 2000-2007 New Year's Eve Ball is the property of the building owners of One Times Square.